Your opinion is important to us. It helps us plan our future direction. Please click the link below to leave feedback regarding our 2016 Community Matters report. 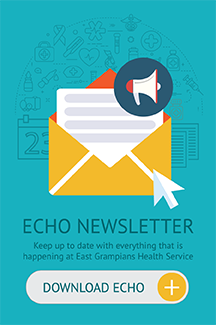 Feedback on your visit to East Grampians Health Service is important to help us know what is working well and what improvements we can make. All feedback including concerns, complaints, suggestions or compliments are welcome. We take complaints seriously and aim to resolve them quickly and fairly. If you are not satisfied with our service, please contact us via our feedback form. Alternatively, if your concern is not able to be resolved by a member of staff and requires an immediate response, please ring the Chief Executive’s Office on 03 5352 9300. If you remain dissatisfied with our response, you may contact the Health Complaints Commissioner (HCC). The HCC responds to complaints about health services and the handling of health information in Victoria. Their service is free, confidential and impartial. To lodge a complaint with the HCC fill out a complaint form online at www.hcc.vic.gov.au or phone 1300 582 113 between 9am and 5pm, Monday to Friday to discuss your complaint. You may also contact the Aged Care Complaints Commissioner who provides a free service for anyone to raise their concerns about the quality of care or services being delivered to people receiving aged care services subsidised by the Australian Government. Visit their website at www.agedcarecomplaints.gov.au or phone 1800 550 552. I cannot speak highly enough of my recent short stay. As soon as we walked through the front door, you could sense the friendly atmosphere at the front desk. Most caring nurses you would ever want to look after you, absolutely wonderful. Once again I offer my many thanks to all concerned. There is no way we can ever thank you enough for the competence, compassion, support and confidence you’ve given us through the pregnancy and the birth of our little boy. We are so lucky that you do what you do. I wish everyone could have the experience we’ve had with you. We will never forget how much you did to help bring our little treasure into our lives. Thanks for your care of me during my recent stay in hospital. Thanks also for my private insurance incentives. Lovely surprise and very much appreciated. My compliments to the dental team, nurses and reception. The dentists and dental nurses are always so friendly and kind and always explain the procedure and care to me. I find the experience here far superior to the private orthodontist we’ve gone to in the past. Thank you. A big thank you to all at EGHS for outstanding care and support during my recent short stay. Once more your staff have excelled at patient care at all levels. Your organisation is a credit to our greater community. To Admission, Surgical and Recovery Staff – I just wanted to say thank you to you all for the kind, gentle and professional way in which I was treated. I’m sure that your management aids in swift recovery and better outcomes for your patients. At all times I felt comfortable and safe and had complete faith in your skills. Once again thank you so much. A very positive experience. All staff greeted me in a positive manner and acknowledged my presence. I was given adequate time for each stage of admission. Staff listened to my questions, concerns and responded to each. Everything ran smoothly and in an efficient way. The facility was modern and clean and the catering was great. The follow up phone call after I had been discharged was a surprise but showed a high duty of care by the Day Procedure Unit. Staff from my first phone call to my discharge were absolutely wonderful. It was my first time under anaesthetic and very anxious. The staff were very professional at putting me at ease and making my first surgery a comforting experience. Will be recommending your facility to anyone I speak to. Keep up the fantastic work!